Are you considering buying a home or business? You may want to consider having the premises inspected for termites and installing a chemical barrier to keep them away from your foundation. GPS is fully accredited for a full range of both Termidor termite protection systems and Termatrac control products. Call us today for a visual termite inspection, fixed-price quote and full report. Termites are our speciality, from inspection and management to chemical barrier installation. We also offer monitoring programs with a detailed plan to address your specific requirements. Sometimes referred to as “white ants,” termites can thrive inside and outside your home without you knowing they are even there. There are more than 300 native termite species in Australia, most of which feed on rotting timber or grass. 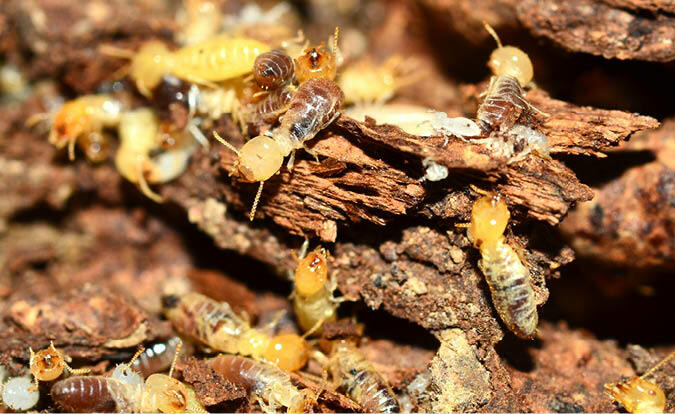 Termites thrive in a high-moisture environment and feed on dead plants and trees both above and under the soil. It can take three to five years for a mating pair of termites to establish a colony, which can grow from one to several hundred million. It may take another couple of years for you to notice signs of damage. Subterranean termites are generally found in soil and build tunnel systems to gain access to food sources above the ground. Drywood termites are found inside wood such as internal walls and furniture. Swarming, or winged, termites are attracted to light and are found around windows and doors in the spring. These termites mate and increase your infestation if not addressed quickly. Termite damage looks and smells a lot like water damage.Signs of termite presence include buckling wood, swollen floors and ceilings and visible mazes along surfaces. Infested wood will sound hollow when tapped. Wings on windowsills and mounds on exterior walls can also indicate termites. Termite damage may smell like mildew or mold. Because termites thrive in a moist environment, eliminating dampness around your home is a good start. Fully insured, fully trained and ready to serve you. We do it right the first time. If you’ve got a pest problem, we have the solution. 24-hour response time, guaranteed.